Lori's work is sold at her annual fall sale, at some Waterloo Potters' Workshop sales, and by special order (Kitchener area only). Since 2001 Lori's sale has been part of the Frederick Art Walk , a Kitchener artisan's tour and sale which will be held this year on Saturday November 11, 2017. 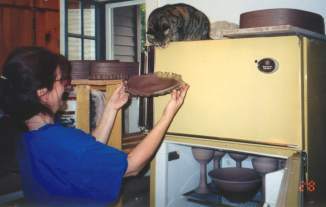 Here are some samples of Lori's pottery from previous years. Click on any picture to view more pieces. Also plates, candlesticks, candle holders, potpourri, and more under "Other Items". Kayla and Lori in the studio. 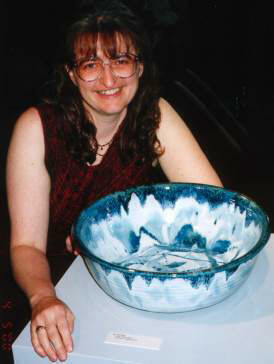 Lori Cole can be contacted via lori@loripottery.com . This site maintained by Jack Cole .